Dogvlog – everyone is a WINNER! 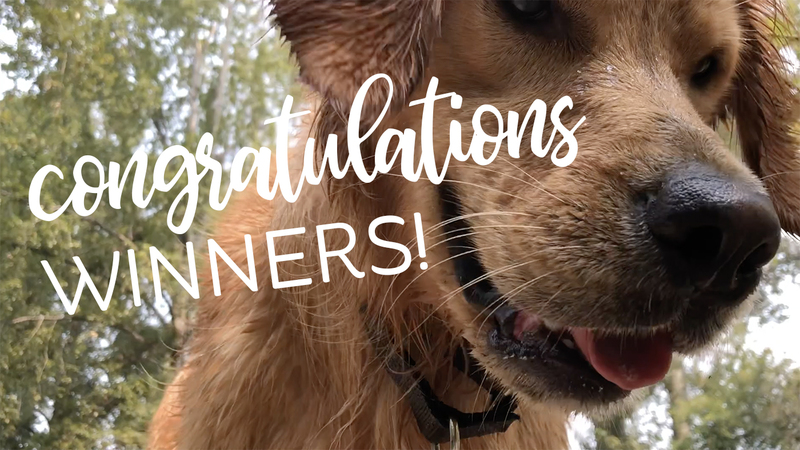 The dogs bring you the list of winners….Prize box and card winners: send me your mailing address!Class winners: send me with the class you’d like! You get to enjoy a walk in the park with the pups! Tomorrow starts SEVEN fall flower videos in a row! Don’t unsubscribe, I’ll only spam you for a week. LOL! Feeling like a winner yet? Wow what fun that was to watch! I do feel like a winner having been able to walk along with your joyful pups! Thank you! That video made my day!! Congrats to all the winners! Congrats to the winners, who I hope are as happy as your pups. Pure joy! Yes I watched the video twice … so far. Great video. Those pups are hilarious. What do you feed them, maybe I should be adding it to my diet, definitely could use an over abundance of energy like that, can you imagine what I could accomplish every day, wow! Thanks for the video, funny, now I need a nap, wore me out watching all that action. Congrats to the winners and yes Sandy I am not a winner but I loved watching the dogs, thank you! Super fun video! !…..what an energy they both have!! Love the puppies. What a nice park for them to play. Wow! I’m not even one of the prize winners but I’m smiling! That made my day. Thanks for such an fun and creative way to share the winner’s list. Now I have to take my fur babies on an adventure. Wow, those two can Goooo! So fun seeing them have so much fun. Congrats to the winners, woo hoo! This is toooo funnnnn! Great way to announce your winners! Congrats to all! Love the video! Makes me happy to see the dogs playing….and to see my name!!!! THANK YOU! I’m so excited I can’t stand myself! Thank you Sandy!!! It was so hard to focus on the names with so much fun happening, I had to watch it twice!! Congrats winners and thank you Sandy for the fun dog walk!! Congrats to the winners. Loved the video. My dog wouldn’t call that a walk, she would think she was either on vacation or in heaven. Congratulations to all of the winners but everyone wins watching that wonderful, playful, happy video. I’m sure it made everyone smile and I’ll bet there are lots of us who watch it more than once. Happy fun doggos! Can tell who’s the alpha! You call that a “WALK” lol. You are such a good mom to your fur babies always taking them to the parks to run and swim!! Thanks for all your videos (cards and pups). Love the video, super fun. Fabulous fun video, glad your babies are as mad as ours, but for us you have to imagine a three legged black Labrador & a small fluffy tortoise shell cat ! OMGosh what an awesome video! I really enjoyed this, Sandy! What a fun way to announce the winners – and congrats to them! Have a wonderful weekend! I second Gini. Watching your dogs run and play put a huge smile on my face, Sandy! Huge congrats to all the lucky winners – and may I just say I’ve never had so much fun finding out I was not a winner!!! Thanks, Sandy – great video!